I’m still trying to get Bonhams! They are one of the top 4 auction houses; Sotheby’s and Christie’s being the top 2 in the world, followed by Bonhams and Phillips as the followers. Bonhams has been sold to Private Equity Epiris in September 2018. In just over a year 2 top ranking individuals have left Bonhams for Phillips (Susan Abeles joined Phillips early 2018 as head of jewelry for North America and Graeme Thompson has just joined Phillips as worldwide head of jewelry and will be based in Hong Kong). In the meantime, they have a beautiful 12.62 carat, Fancy Orangy Pink diamond with a VS1 clarity being offered on May 1, 2019 in New York. 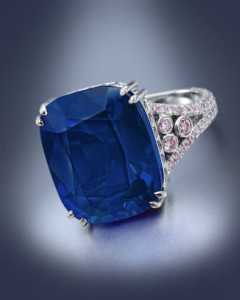 This diamond and a 15.23 carat Kashmir Sapphire are the only two items evaluated above $1 million on offer. 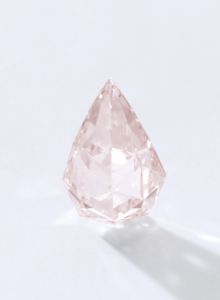 The 12.62 carat, Fancy Orangy Pink diamond is evaluated between $1.5 million to $2 million or $119k to $159k per carat. 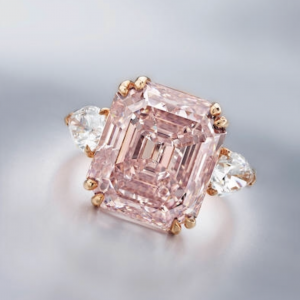 The only larger Fancy Orangy Pink diamond ever to appear at any auction is the 15.20 carat, VS2, sold on November 11, 2015 at a Sotheby’s Geneva auction, which was previously owned by Sean Connery. It was sold for $266k per carat. This also happens to be the official world record for a Fancy Orangy Pink diamond. From out of all the secondary color for a pink diamond, orangy secondary color is the second most desired (after purplish). Other secondary color for pink diamonds on the market but less desirable is brownish and grayish. I would really like to see Bonhams take its potential to the next level with Fancy Color Diamonds. There is much room for them to grow in this area and while two of its top specialists left for Phillips it remains to be seen how Bonhams will transform itself now that they are in private hands!